Homepage. 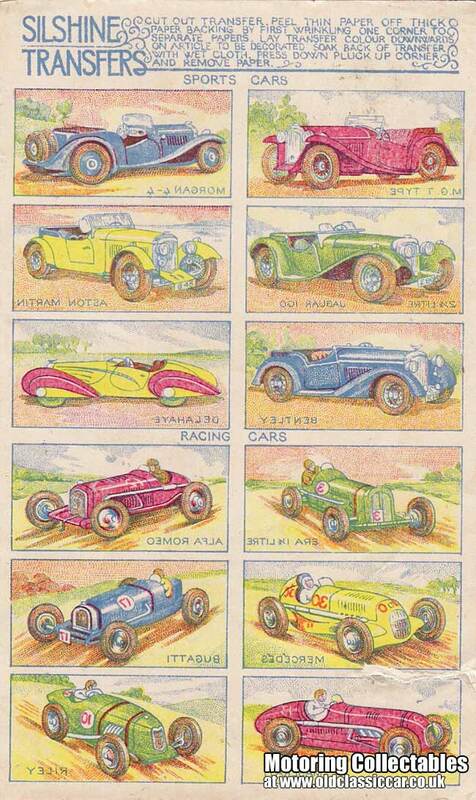 This page: A sheet of paper-based transfers that feature classic motors. I found this sheet of transfers, produced by Silshine, at an antiques shop some years ago, and haven't come across any others like it so far. 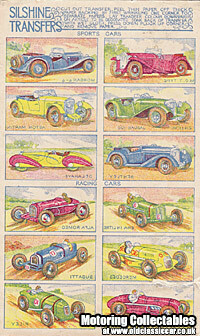 My guess is that the sheet dates to the 1940s, judging by the sports and racing cars shown on it. The sporting motors featured are: Morgan 4-4, MG T Type, Aston Martin, 2.5 Litre Jaguar 100, Delahaye, and a Bentley. Racing car transfers are as follows: Alfa Romeo, ERA 1.5 Litre, Bugatti, Mercedes, Riley, and Maserati. The instructions are as follows: Cut out transfer, peel thin paper off thick paper backing by first wrinkling one corner to separate papers. Lay transfer colour downwards on article to be decorated. Soak back of transfer with wet cloth. Press down, pluck up corner and remove paper. A small thumbnail scan of this transfer sheet is shown on this page, you can also view a larger scan of these Silshine transfers. Try as I might, I've not been able to find out much about this product. A search online just brings up ebay auctions for similar sheets, but on different subjects. The only references I see on other websites is to haircare products or car valeting products!! If anyone finds other mentions about these transfers, please let me know!